Make Up by J.: Giveaway Numero Uno! Giveaway Numero Uno on Britney Spears & Justin Week is Extrashade! We can't say enough good things about this product. Not only is it capable of shielding SPF 30 rays, this company also supports cancer awareness & support initiatives. We were lucky enough to speak to the owner & score some Extrashade swag that even Justin Bieber would be proud of. 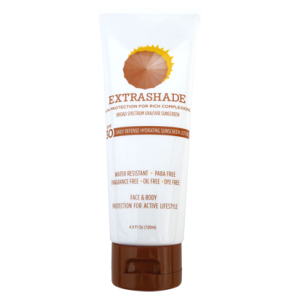 What's nice about Extrashade is that it works for all ethnicities, but keeps the multicultural shades in mind with all it's non-ashy & good for hyperpigmention qualities in tow. WE JUST WANT SOME SUNSCREEN TO LOVE... OOOH! Comment below or tweet to @makeupthebay for your chance to win a bottle. We love the comments! Keep them coming!